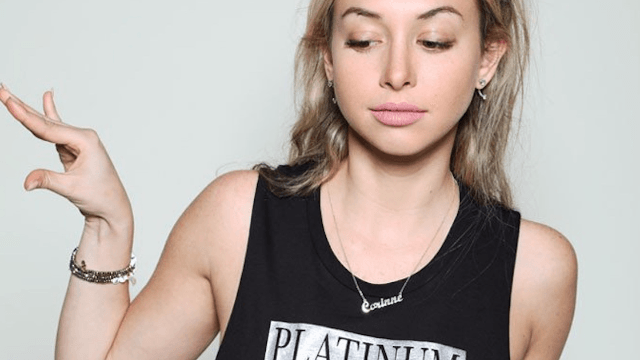 'The Bachelor' alum Corinne proves she's nuttier than we thought with new 'Platinum Vagine' t-shirts. There's no question that contestant Corinne Olympios (along with her cheese pasta-making nanny Raquel) was the star of this year's season of The Bachelor. If you were sitting there watching the show and thinking, "Huh, I wish I could get Corinne's hilariously bizarre quotes on a t-shirt," well, I have some good news for you. Corinne announced her collaboration with Riot Society in an Instagram video posted Tuesday. In addition to the "Team Corn" products, fans of The Bachelor can also purchase shirts with Corinne-isms such as "Dude I Need Sushi," "Ok, But First Cheese Pasta," "Cheese Pasta & Chill," "I Need A Raquel," and, perhaps the best one, "Platinum Vagine." There are also several tops that pay homage to Corinne's love of napping. Spoiler alert for everyone I know: You're all getting "Cheese Pasta & Chill" t-shirts for Christmas.